Jonas Mekas and the Film-Makers' Cinematheque cont. 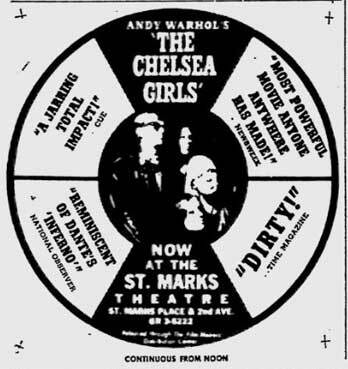 After the run at the Cinema Rendezvous, The Chelsea Girls opened at the Regency at the beginning of 1967 - "Released through The Film-Makers' Distribution Center." 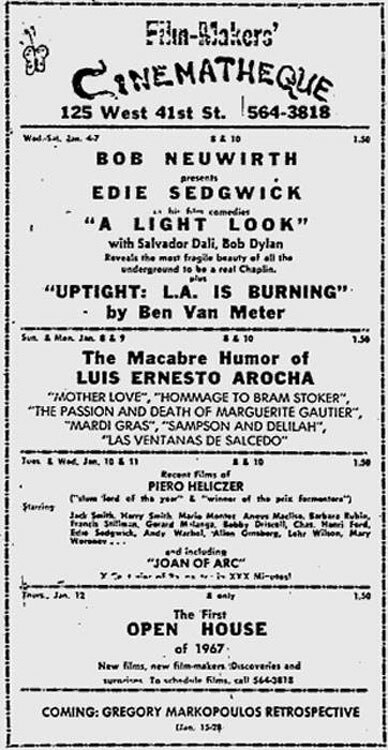 In the same January 5th issue, there was an ad for the Film-Makers' Cinematheque at the 41st St. Theatre at which Bob Neuwirth was presenting "film comedies" starring Edie Sedgwick who was referred to as "a real Chaplin." "During the summer and fall [of 1965], Edie started saying she was unhappy being in underground movies. One night she asked Mel and me to meet her at the Russian Tea Room for a 'conference.' She wanted him to arbitrate while she explained to me how she felt about her career... That night she said she'd decided that she definitely was going to quit doing movies for the Factory. Jonas Mekas had just offered us a lot of consecutive nights' screenings at the Cinematheque to do whatever we wanted with, and we thought it would be fabulous to have an Edie Sedgwick Retrospective - meaning, all of her films from the last eight months. When we'd first thought of it, we all thought it was hilarious, including Edie. In fact, I think Edie was the one who thought of it. But now, this night at dinner, she was claiming that we only wanted to make a fool out of her. The waiter moved the Moscow Mules astride and put our dinners down, but Edie pushed the plate aside and lit up a cigarette. 'Everybody in New York is laughing at me,' she said. 'I'm too embarrassed to even leave my apartment. These movies are making a completely fool out of me!'" And yet, here, was her boyfriend/manager Bob Neuwirth presenting her as a comedian in an ad in the Village Voice. The ad also mentions an "Open House" where filmmakers could bring their films to be screened. But, again, this was not a midnight screening, but took place at 8 pm. 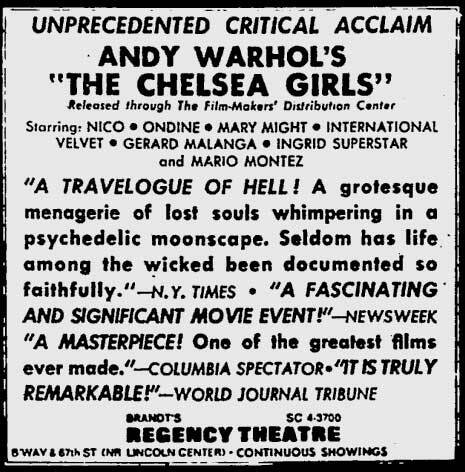 In addition to showing Warhol's major films like The Chelsea Girls (and later in the year, **** (Four Stars), through the Film-Makers' Distribution Center, Mekas continued to show Warhol films at the "Cinematheque" then operating out of the 41St. Theatre. Below is an ad from the 27 April issue which includes Willard Maas' film, Andy Warhol's Silver Flotations and an Open House at 8 pm. 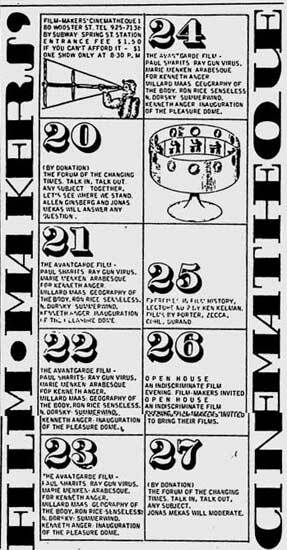 Although the bottom half of the ad includes releases by the Filmmakers Distribution Center, Mekas did not announce the formation of the FDC until the 7 September issue of the Village Voice (see below). The stated purpose of the FDC was to distribute films that had a wider public appeal than most of the underground films shown by Mekas at his Cinematheque. 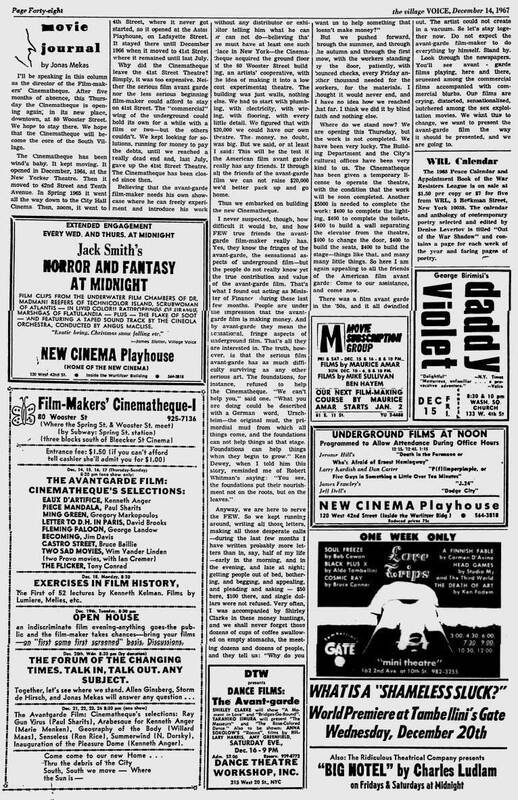 In the 7 September 1967 issue of the Village Voice, an ad announced that the 41st St. Theatre would be renamed the 42nd Street Cinema and would be used by an offshoot of the Film-Makers' Co-op, "the Film-Makers Distribution Center," to show films that "have a need (according to the film-makers' wishes) of wider audiences..." Later, the name of "New Cinema Playhouse" would also be used for the venue. According to the ad, two other venues would be used as the Film-Makers' Cinematheque - Cinematheque I at Wooster Street for anyone who wanted to show their films and Cinematheque II which would show "carefully selected" films. Mekas wasn't just announcing the establishment of three venues in his ad, he was also announcing the creation of a new borough. 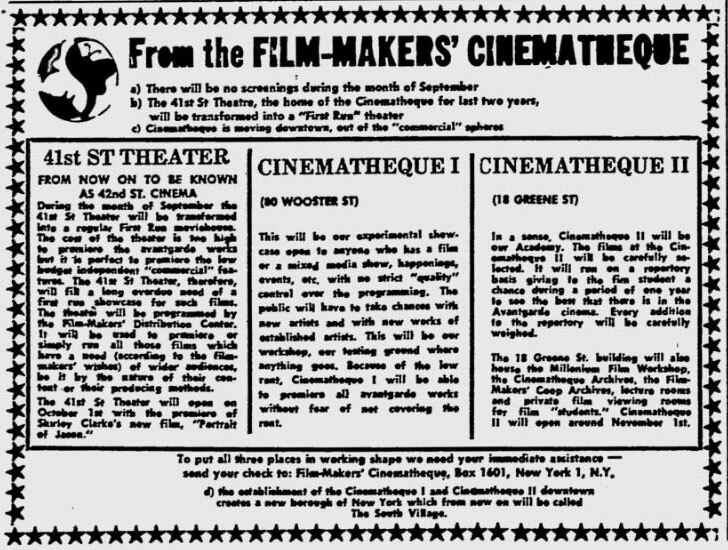 At the bottom of the ad is the statement, "the establishment of the Cinematheque 1 and Cinematheque II downtown creates a new borough of New York which from now on will be called The South Village." The Fluxus artist George Maciunas (who was, like Mekas, a Lithuanian refugee) had purchased all or part of the buildings at 16-18 Greene Street and 80 Wooster Street for use as artists' co-ops. "Avant-garde art was radically changing the cultural landscape of New York City and the artistic centers of Europe. But in New York, artists were not able to earn enough money to live and work. Apartment prices were too high for most artists, who also needed to rent additional space in which to create their art works. Indeed, without viable live-work space, there would be no art. Maciunas came up with a brilliant vision: cooperative loft living. Although 80 Wooster Street would remain a Fluxhouse Cooperative, Maciunias had apparently only purchased "four spaces" in Greene Street. After residents became irate over Maciunias' failure to pay real estate taxes, they unaffiliated themselves with him through their solicitor. Although the Village Voice ad above indicates that the Greene Street location was to be an "Academy" where the best of the avant-garde cinema would be shown - a bit like the later Anthology Film Archives - it never happened. Mekas didn't immediately use the venue at Wooster Street because it apparently needed extensive refurbishment. According to his chronology ("Showcases I Ran in the Sixties" in To Free the Cinema) he didn't start using Wooster Street until early 1968, although Village Voice ads indicate that the first showings were in December 1967 (see below) . Mekas also continued to release films through the Film-Makers' Distribution Center. 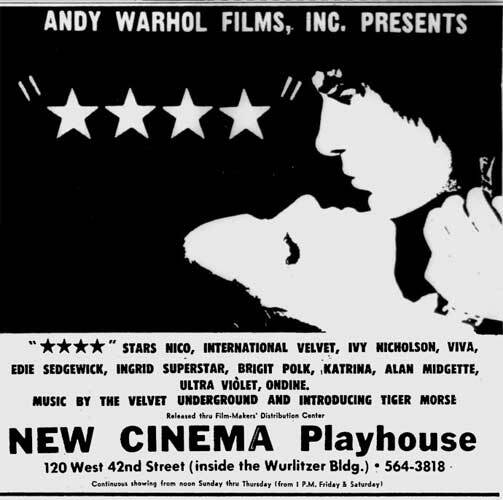 On 14 December, 1967 an ad appeared in the Village Voice for the one and only showing of Warhol's "25 hour film" **** (Four Stars) on Friday 15 December 1967 at the New Cinema Playhouse at 120 West 42nd Street. 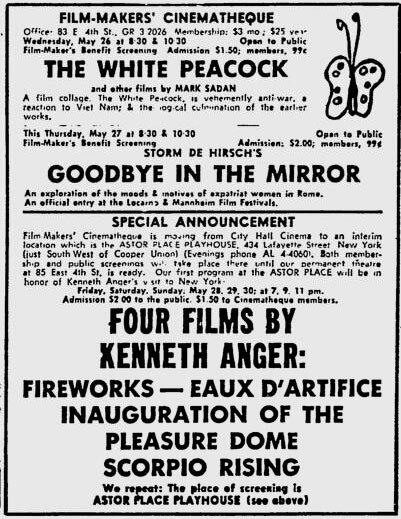 The address of the New Cinema Playhouse was the same address of the 41st St. Theater which Mekas had renamed the 42nd St. Cinema in the 7 September ad above. The address given for the 41st St. Theater in a previously produced ad from 25 November 1965 is "125 West 41 St. or 120 West 42 St." (The venue apparently had two entrances.) 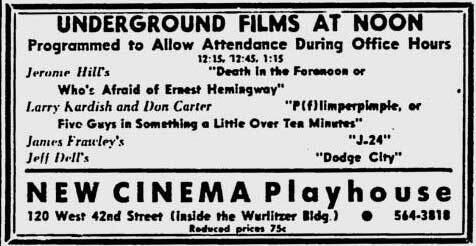 In other words, the New Cinema Playhouse was the same venue as the 41st St. Theater which was the same venue as the 42nd St. Cinema. In the same issue of the Voice that carried the ad for the full version of **** (Four Stars), Mekas announced the opening of Wooster Street. The Wooster Street Cinematheque actually opened in December 1967 as the ad on the lower left corner of the above page from The Village Voice shows, as well as the ad at the bottom of this page. The account that Mekas gives of his venues in his column in the 14 December issue does not always agree with what was advertised in the Voice. He writes that the Cinematheque opened in December 1964 at the New Yorker Theatre. 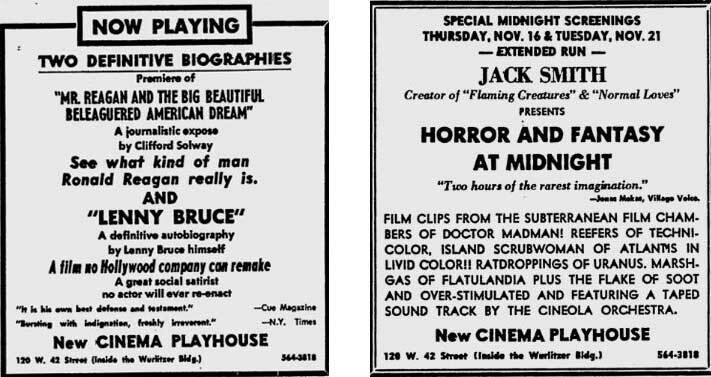 This agrees with the ads more or less - the 26 November 1964 Village Voice ad (above) gave the first screenings as 30 November. The films on the 30th included Andy Warhol's Newsreel. Mekas goes on to write, "In Spring 1965 it [the Cinematheque] went all the way down to the City Hall Cinema." This, again, more or less agrees with the Voice ads - the first ad for the City Hall Cinema was for the February 4th showing of Mekas' film Guns of the Trees. Mekas continues: "Then zoom, it went to 4th Street, where it never got started [see page three], so it opened at the Astor Playhouse, on Lafayette Street." 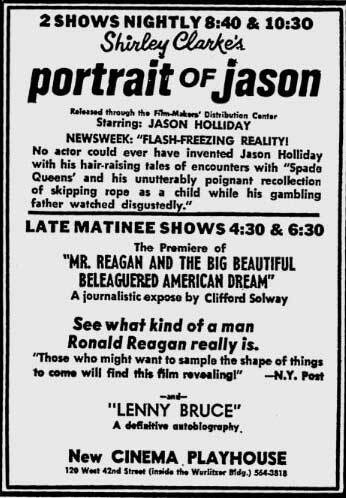 Village Voice ads show screenings from June to November 1965 at the Astor Place Playhouse. 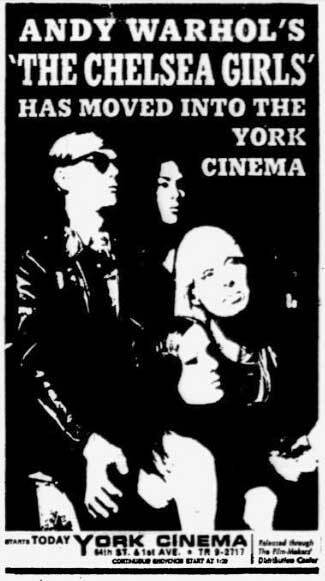 Mekas announced the move to the Astor Place Playhouse in the 27 May 1965 issue of the Voice. Although Mekas' column might give the reader the impression that there was a dearth of experimental or independent screenings as a result of him no longer using the 41st St. Theatre as his Cinematheque, the venue continued to show experimental films, including the work of Jack Smith, under the name "New Cinema Playhouse." The above ads don't mention any of Mekas' entities (i.e. the Film-Makers' Distribution Center or the Cinematheque) but Mekas was a champion of Smith's work and the ad does quote him. 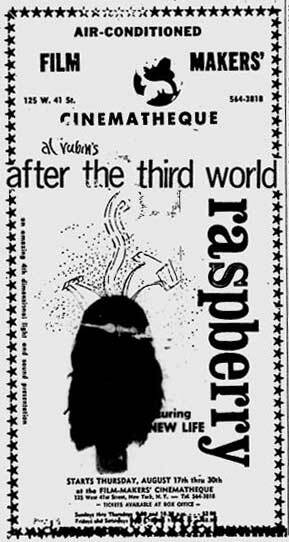 Later in the month, a similarly designed ad for a Shirley Clarke screening, along with the Lenny Bruce film, appeared in the Voice which did indicate that it was an FDC evening.